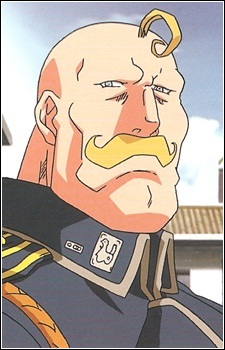 Major Alex Louis Armstrong, the Strong Arm Alchemist, was born into an elite family of alchemists and has mastered his family's techniques. Members of his family have, in the past, filled the highest military and political positions in the state. He acquired his alchemy titles for his skill of using arm strength in his alchemy. All though he may look intimidating, he is really friendly and (overly)affectionate, and often stays behind or risks his life for the safety of others. He also has a tendency to show off techniques passed down to him to his enemies, and make them feel somewhat awkward during a battle. The scion of the illustrious Armstrong family, Alex is a remarkably caring commander and friend as well as an invaluably skilled ally to Colonel Roy Mustang and Edward Elric.